One of the most popular designs that likely resulted from Moore’s work at Crystal was the Storm Pattern.It is generally defined as a central rectangle connected by zig-zag lines to smaller rectangles in each corner. The storm pattern often is said to have symbolic meaning: the zig-zags are lighting, the corner rectangles are the four sacred mountains of the Navajo or the four directions or the four winds, etc. 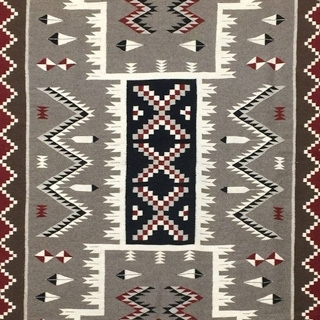 Nevertheless, the great variety of interpretations suggests that meanings were assigned by traders and collectors, not by the Navajo themselves.The storm pattern’s precise origin is uncertain-one story suggests it was developed by a trader on the western side of the Reservation-but the weavers at Crystal developed this concept into one of the most popular and lasting of all Navajo rug patterns. Navajo Storm Pattern Rug by Gaberial Benally, c. 1970-80, 76.5" x 53.5"